Dave Allen wants to hear Jeff Beck's song Hi-Ho Silver Lining sung 'loud and proud' by Chesterfield fans as the players emerge from the Proact tunnel. 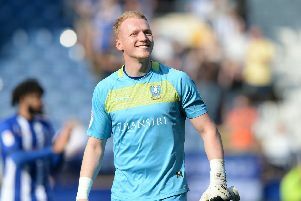 The song is famously sung at Hillsborough when Sheffield Wednesday play, but the Spireites owner and former Owls chairman insists there's no reason why Chesterfield can't adopt it. He says he was the one to introduce the 1968 rock single to Wednesday's pre-match routine after it created a buzz at one of his nightclubs. "We desperately need to create an atmosphere when the players come out and to that end we should use Jeff Beck’s record – Hi-Ho Silver Lining," he said. "This record is not ‘owned’ by Sheffield Wednesday. It all started at Josephines Nightclub where on a Saturday night when the place was ‘rocking’, we used to play it and see who could sing the loudest: ‘Hi Ho Sheffield Wednesday or Sheffield United’. "I took it down to Hillsborough when I became a director at Hillsborough." Hi-ho Silver Lining has also been an anthem for Wolverhampton Wanderers and Aston Villa, while supporters of Sheffield Steelers ice hockey club have also belted out their own adaptation of the song over the years. Allen is urging Town fans to sing their own version this weekend when Barrow visit the Proact. " Now there are a number of clubs use it so there’s no reason why we shouldn’t use it," he said. "Come on everybody, sing it loud and be proud: ‘Hi-Ho Ches-ter-field’. "I’ll get the DJ geared up. Enjoy your football."